"Mom, I have the best surprise for you! It's handmade out of wood and has three nails." Andrew had hammered together a tiny table from our neighbor's scrap pile. Elise wasted no time making it pretty. 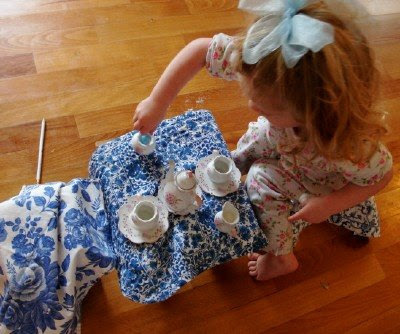 Oh ..the perfect tea party....so sweet. This might be my favorite LMS post of all time! This reminds me of when I was little....my father was a builder and if I were lucky I could visit job sites with him. I made so many things with my "found goods". I'm sad to say that I never had such a lovely tea party with them though. I love that you encourage them to be creative. I have such a hard time with this because I focus too, too much on the possibility for a mess! Like mother, like daughter, huh? I need to change some habits or in 2 years the first thing Libbie would do is throw her mail on the table. I just went over and gave you a vote, hope you win! That's an adorable tea set she has. Is it glass or plastic? And your son is just too sweet. thanks! It's a plastic tea set from Toys R Us that someone sent in the mail along with Andrew's birthday present. She loves it! Believe it or not, she went right to work getting her own napkins to cover the table, etc. She is just 100% little girl and I am loving every minute of it! That is a precious picture! I just found your blog recently, and I'm enjoying it! For my daughter's 9th birthday she rec'd a real toolbox with some tools of her own...she was borrowing dad's so often (and not returning them)we decided to just give her her own set. It is about how moms that are being laid off are giving being a "stay at home mom" a try.